Mid-Autumn Festival celebrations date back more than 2,000 years. In feudal times, Chinese emperors prayed to Heaven for a prosperous year. They chose the morning of the 15th day of the second lunar month to worship the sun and the evening of the 15th day of the eighth lunar month to hold a ceremony in praise of the moon. The temple of the Moon was located in Yuetan Park in the Western Districts of Beijing and it was to here that the emperor would go to offer sacrifices to the moon. Mid-autumn marks the time when farmers have just finished gathering their crops and picking the fruit from their orchards. They are overwhelmed with joy when they have a good harvest and at the same time are delighted after a year of hard work. The 15th Day of the eighth lunar month has evolved as a widely celebrated festival for ordinary people. People in different parts of China celebrate the Mid-Autumn Festival in different ways. One custom however is shared by all the Chinese and this is eating the festive specialty: moon cakes. Baking moon cakes started as a family tradition but over time has become commercialized till today when moon cakes are heavily promoted through stores and supermarkets. 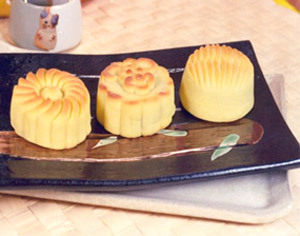 Moon cakes vary depending on the region of the country and many varieties exist with different flavors. Beijing moon cakes have a thin crust and fillings of bean and jujube pastes and are very sweet. Guangdong (Canton) moon-cakes are perhaps the most delicately made with fillings that are carefully selected. They include sesame, almond and walnut kernels, shredded coconut, lotus seeds and egg yolk. Whatever the part of China you come from the Moon cake is an essential part of the celebration.